They are the face and heart of our company, and if they are happy, healthy and trained, we know they will take care of our customers and community in turn. The Bill Howe Family of Companies has grown into a household name and has been a staple in the San Diego community. One of the largest plumbing service and repair companies for 35 years, they have grown by adding services in San Diego heating, air conditioning, and flood remediation for home owners and businesses looking for a one-stop-shop. Part of the success of the family-owned company has been to hire and retain talented employees to help service their loyal customers in San Diego. The award-winning Bill Howe Family of Companies started with a simple mission to: build a company of healthy, happy employees, and offer them a successful career, deliver quality and affordable services for San Diego residents, and to give back to their community through volunteerism, financial contributions and pro-bono work helping those in need. The company offers education and training opportunities for their field employees, 100 percent paid for, through the San Diego Plumbing-Heating-Cooling-Contractors Academy. The company also understands that training alone is not enough; they must also recognize the excellence of the team they have built. 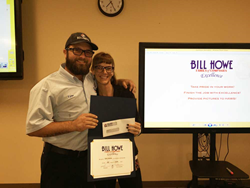 The Bill Howe Family of Companies has always provided ample recognition within the company, birthdays, anniversaries, births and several “employee of the month” awards. In 2015, the company redesigned the monthly awards, opening it to all employees and creating four distinct recognition categories. The categories are: Above & Beyond, for employees who take that extra step to help customers, the company and their colleagues, Excellence, presented to the employee who demonstrates the highest level of craftsmanship, Leading by Example, for the employee who exemplifies the high standards of Bill Howe, and Customer Service, for the employee who delivers the most exceptional customer service. Input from office staff, the employees themselves, and management are considered each month and announced (for the previous month) at the company meeting. Additionally each recipient is presented with a certificate and bonus check. The September Award winners announced at the October meeting were: Saul Serrano for Above & Beyond, Chris Orwen for Customer Service, Tyler Cervantes for Excellence, and Brandon Pettway for Leading by Example. For more information about the monthly awards, or the Bill Howe Family of Companies, visit http://www.billhowe.com, or to speak with Bill or Tina Howe regarding this announcement, contact Bill Howe Marketing Director, Julie Riddle at Julie(at)billhowe.com.